The Cine Capitol opened in October 1933, showing Paramount films. The movie palace is located on the ground floor of a large 15-floor Art Deco style building (the award winning Carrion Building), which also contains the Capitol Hotel, apartments, office space and retail. In accordance with a 1926 plan, architects Luis Martinez Feduchi and Vicente Eced were hired to design the building in 1927. The building was constructed between 1930 to 1933. The Carrion Building combines various 20th Century architectural styles including Expressionist and Art Deco. Following Art Deco themes, the building is shaped like the bow of a luxury ocean liner. Everything was specially designed from the door-knobs to furniture, and it was Madrid’s first building to have air conditioning in the entire building. The exterior of the Cine Capitol is brilliantly lit with neon which looks especially outstanding at night. The auditorium is 30 meters high, and at 32 meters wide, was built with the widest span in the world at that time. The accoustics are excellent, one reason being that except for the ceiling and stage, the auditorium’s interior was covered with cork that was overlaid with velvet. The cinema opened with 1,864 seats. The magnificent Art Deco style auditorium features a stepped ceiling which has troughs of backlighting. The movie screen is huge and the surround sound is excellent. Just as the building was hailed when it was first built for being so modern, the cinemas’s design still appears futuristic and state of the art today. 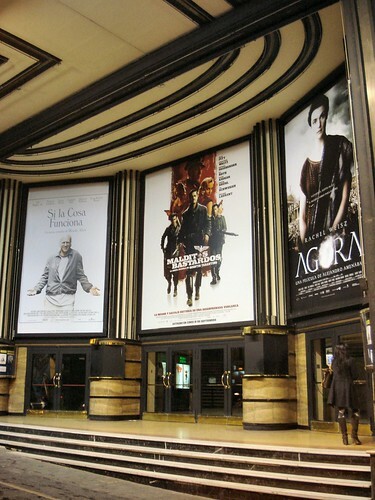 The Cine Capitol has always been one of Madrid’s premier, flagship movie palaces showcasing the latest movies. The main auditorium with its orchestra floor and two balconies survives intact. Two extra screens have been installed in the last decade in adjacent spaces in the building. The building was used in the Spanish movie “El Dia de la Bestia” (The Beast’s Day), in which a group of actors get down the building through the famous Schweppes neon advert which is located on the top of the facade. As of 2017, the main auditorium seated 1,360 with Patio seats 745, First Amphitheatre or Club 304 seats, Second Amphitheatre or Mirador seats 311. It is equipped with Dolby Digital Sound. Auditorium 2 has 217 seats and auditorium 3 has 213 seats. Events other than movies are also held at the Cine Capitol. By 2017 it had been taken over by Grupos Media theatre chain. Opened in October 1933, the seating capacity was given as 1,032 in the stalls, 347 in the 1st balcony, 447 in the 2nd balcony and 20 loge seats which gives a total seating capacty of 1,846. The main feature of the magnificent Art Deco style auditorium is the stepped ceiling which has troughs of backlighting. Lost Memory, your photo is indeed that of the Capitol. I meant to write “De Nada” to Lost Memory, but it was lost. This building still looks fantastic as you stroll down Gan Via by day or night. What a great building and intact too! the name of the architect (the correct bibliografical reference) is Luis MartÃ­nez Feduchi. anybody know how to edit it? And yet another photo of the entrance of the Capitol, taken in October 2009.